We are all aware that technological advances have increased the size of the data we can capture and manage. I remember reading that approximately 90 percent of all the data in the world today has been created in just that last few years. And more than 75 percent of that data is unstructured, coming from social media, smart phones, text messages, and other sources. Obviously, the Internet has a lot to do with this explosion of raw data. New industries have been created to help us manage big data, to process it, and to make it consumable. But the real return on investment for organizations is to make big data useful. For example, watching Twitter and observing tweets about a big storm impacting our coastline is interesting, but it’s not all that useful. From a data perspective, it’s mostly just a lot of noise. But taking those tweets and mapping their location to see where services are out and where people are in trouble, then making that location-enriched information available to dispatch workers and emergency crews—now that is useful. Phoenix Sky Harbor International Airport is a busy place. More than 12,000 aircraft, over 100,000 people, and 800+ tons of cargo pass through the airport every day. Nearly a quarter million people are employed at Sky Harbor, resulting in a nearly 10 billion dollar annual payroll. 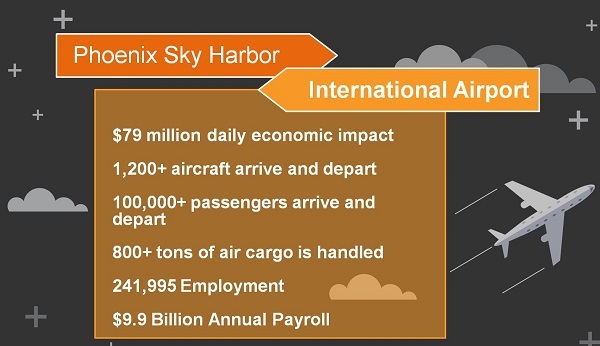 Sky Harbor has a daily economic impact of nearly 80 million dollars. That’s a remarkable amount of business taking place. Now think about the infrastructure needed to support such an operation. There’s water, electrical, telephone, and computer networks, smoke detectors, air conditioners, security systems, and so on, distributed across four massive terminals and a 3,000 acre facility. The volume and velocity of data passing through Sky Harbor systems is quite a challenge to manage. Not very long ago, the City of Phoenix, which operates Sky Harbor, realized that the Aviation Department needed an information system that would help improve how workers and operations managers could use this data more efficiently. They integrated a geographic information system with their enterprise work order management system to help improve the accuracy and efficiency of maintaining their complex infrastructure. Now, for example, when a maintenance worker must repair air conditioning equipment, the worker can access a web portal to find the exact location of the problem unit and also see other nearby equipment that is due for maintenance. By using maps to visualize and analyze their network data, the Aviation Department can now prioritize work and maximize productivity. Another way to say it is that by using location, they were able to turn the churn of data overload into actionable results. At the bottom, we see massive volumes of raw data coming from a multitude of sources at a speed that only automated processes can handle. 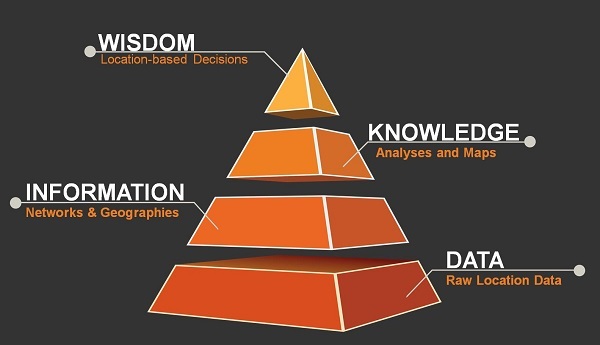 The raw data is filtered or organized into meaningful groups of information so that we can start to make sense of it. Next, the information is given context through analysis and shared with stakeholders in the organization. And finally, we use the results of analysis to make the best decisions and take the most positive actions. What’s not readily apparent in this model is the concept of location data. Data points such as addresses, coordinates, and other location values are most likely embedded in the raw data, and this location data is often underutilized by organizations. Using a GIS, you can organize raw location data into networks and geographies to create layers of information. These layers are analyzed and then assembled into maps that provide a proper context for where and how physical features as well as predicted patterns exist in space and in relation to each other. Finally, you can use maps to prioritize decision-making and taking action. Mapping and spatial analysis are best deployed as a location platform. This platform is centered on Web GIS, which includes Portals for organizing and managing spatial data, and mapping services that can be integrated with enterprise applications and data. Web GIS makes it possible to support anyone with authoritative, up-to-date geographic information as part of their routine work. And focused apps make it easy for anyone in the organization to make maps, do analytics, and access shared maps and data. When you’re using a location platform to help you make decisions, you shouldn’t be looking at your data alone. Not only should you map your data, but you should also consider adding other layers of information in relation to those maps, like the demographics, or perhaps competitive or complementary businesses in the area. And you should look at enriching your databases and spreadsheets with additional columns of information in the same way. These processes—locating data points in geographic space, analyzing that data to discover patterns and trends, and enriching that data with authoritative geospatial attributes—are all enabled by spatial analysis. Put the power of spatial analysis to work in your organization and you’ll find that geography just might be the answer to putting big data into context and making it work for everyone. 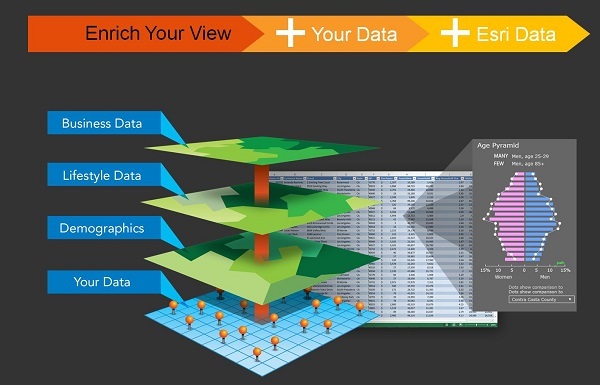 This post is an excerpt from my presentation at Computerworld Data+, September 7-9, 2014 in Phoenix, Arizona.